The Ignitor .272 For Gold Tip Nitro Crossbolts contains 3 Lighted Nocks. Installation is Easy: Install the insert, Place the Ultra LED in Nock & Slide nock into insert. 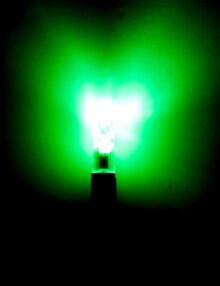 The Red LEDs provide 15 hours of continuous light and the Green LEDs provide a whopping 50 hours of continuous light. 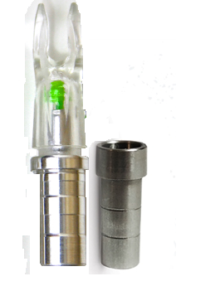 The Ultra LED lightsticks are removable & replaceable! 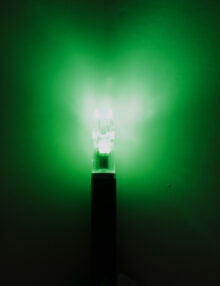 When it is time to replace the LED lights, simply order a pack of replacement lights. Also, LEDs can be removed during practice to conserve battery life. Ignitor Lighted Nocks Are Covered By Our 100% Unlimited Lifetime Warranty. "We want to get things to you as quickly as humanly possible"
We offer Free Shipping in the continental United States on all orders over $75.00 - via USPS. Expected delivery time in 5-7 business days. If you just can’t wait… then we also offer UPS. There is a shipping charge for this expedited shipping method. We are not in business to "profit" from shipping; however we do charge what we are charged so we can keep the door open. A variety of services are available so take a look on the site when ordering to clarify what they offer. • "Availability". Every product "Usually Ships in 48 hours". We do send you an email to let you know “we’re on it”. We do our best to ship items out as quickly as possible. • The method of delivery - our Free shipping method is USPS. If we use UPS, make sure you choose something other than a PO box. The big Brown Truck just don’t like to stop at the Postal Box. Additionally, please note that delivery time is also based on "business" days. For example, if you place an order on Sunday, it's impossible for us to ship an item the same day cause we do go to church… and we found that all the shippers are in church too cause they are closed. International Shipping: If you'd like to make a purchase and have it shipped internationally, please send us an email at info@nufletch.com. Be sure to include the products you'd like to purchase, your shipping address, phone number, and the email address to which we should send a Paypal invoice. A member of our Customer Service team will contact you to make all the arrangements. Please note: we do not understand why if you are ordering from Canada you just don’t move from that frozen ground to the USA. Return Policy: If you are not entirely satisfied with your purchase, we’re happy to help! For detailed return information CLICK HERE. Thank you for your business and we hope to become your new hunting partner for life. The Ignitor Xbolt .285 ID’s contain 3 complete Lighted Nocks that fit .285 ID Bolts. Choose From Red or Green and available with Half Moon or Flat nocks. The Ignitor .224 ID is engineered to provide precision fit replacement of the rear bushing used to house R nocks. This system is perfect for the Black Eagle Spartan arrows. Nocks are available in 3 and 6 packs and offered in Green or Red. The packs provide completed Lighted Nocks that will fit the .224 ID once the R Nock Bushing is removed. Bond the provided insert into the shaft after removing the rear “ R” nock bushing. Friction fit of the IGNITOR nock occurs inside our insert. Nocks remain fully index-able! Installation is Easy: Remove the “R” Nock bushing. Removal yields a .224 ID. Replace by bonding the IGNITOR insert into the arrow using common insert glue. Place the Ultra LED in Nock & Press fit the nock into insert. Nocks remain fully index-able! 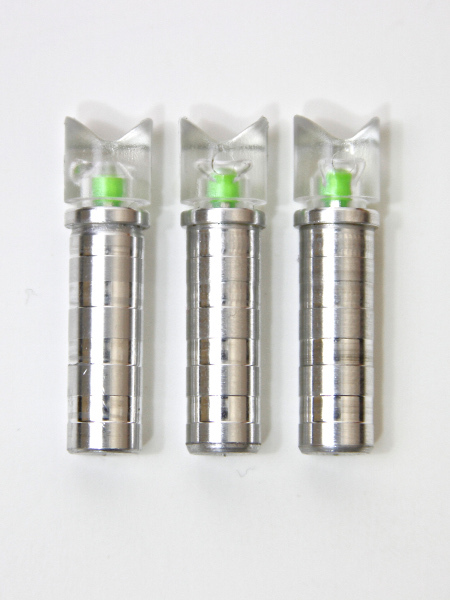 Ignitor Lighted Nocks (Nock and Insert only) Are Covered By Our 100% Unlimited Lifetime Warranty. The Ignitor .204 ID’s for X Nocks are available in 3 and 6 packs and come in Green or Red. 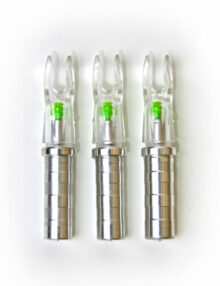 The packs provide completed Lighted Nocks that will fit slim line arrow sizes: X arrows. ** Note: Bond the insert into the shaft. ** Press fit of the nock occurs inside our insert NOT THE ARROWS ID! ** Nocks remain fully index-able! Installation is Easy: Bond the insert into the arrow using common insert glue. Place the Ultra LED in Nock & Slide nock into insert. Nocks remain fully index-able! The Ignitor .233 ID’s for H Nocks are available in 3 and 6 packs and come in Green or Red. The packs provide completed Lighted Nocks that will fit the .233 ID H Nock size.